BANDAI NAMCO Amusement Europe Ltd (BNAE) will once again present one of the largest booths at this year’s EAG. Showcasing the different divisions of the company, including Games, Prizes, Virtual Reality, Management Solutions, Operations and Entertainment Projects. “We have tested a number of the new releases seen at the IAAPA show, which we felt would be ideal for our markets and these can be found on our stand, alongside some brand-new developments, which we are very excited to show for the first time,” said James Anderson, Sales and Commercial Director BNAE. Showing from Raw Thrills is an exciting new snowboarding game, X Games Snowboarders, which will continue the success of SnoCross. 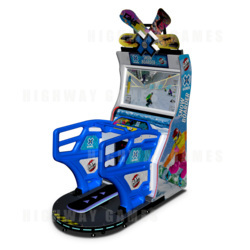 Featuring a snowboarding experience in a stand-up cabinet, which even includes wind effects and five downhill tracks for players to try. Another game showing at the Expo is, from Adrenaline is a new game featuring the Rabbids characters. Rabbids Hollywood is a four-player video game title with a massive 120-inch screen. Players must try to stem the invasion of the crazy creatures in three different movie sets using a number of methods, in a tin-can alley shooting style. BNAE is planning to start 2018 with a bang and we here are interested to see what's next.